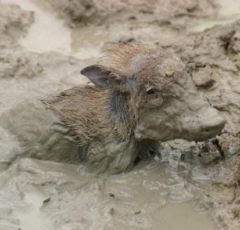 The Mud Report: Who Pays the Externalized Water, Air, GHG Pollution and Health Costs of CAFOs? We All Do. 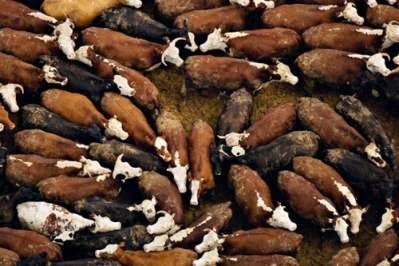 Who Pays the Externalized Water, Air, GHG Pollution and Health Costs of CAFOs? We All Do. Once upon a time livestock lived on mixed farms, they grazed in pastures of mixed greens whose makeup changed from season to season and bio-region to bio-region. That was then, now the meat eaten, especially in capitalist countries, is dominated by Concentrated Animal Feeding Operations [CAFOs], a more banker and investor friendly name. CAFOs contaminate aquatic ecosystems. The two main contributors to water pollution caused by CAFOs are soluble nitrogen compounds and phosphorus. The eutrophication of water bodies from such waste is harmful to wildlife and water quality in aquatic system like streams, lakes, and oceans. Because groundwater and surface water are closely linked, water pollution from CAFOs can affect both sources if one or the other is contaminated. The contamination of groundwater with pathogenic organisms from CAFOs threatens drinking water resources, and the transfer of pathogens through drinking water contamination can lead to widespread outbreaks of illness in humans as well as other organisms that underlie the web of life we all rely on. CAFOs also contribute to the reduction of ambient air quality. CAFOs release several types of gas emissions— ammonia, hydrogen sulfide, methane, and particulate matter—all of which have varying human health risks. Critics have long argued that the "retail prices of industrial meat, dairy, and egg products omit immense impacts on human health, the environment, and other shared public assets. As Katy Kiefer's article 'Factory Farms Are Bad for Your Health' explains, "Every single day, factory farms feed their animals low doses of antibiotics to make them grow faster and prevent disease in filthy, crowded living conditions. In fact, the factory farming industry uses 80 percent of the antibiotics sold in the U.S. And now, the medical community is warning that the medicines we’ve been relying on since the 1940s may no longer work when we need them." The largest use of antibiotics in the world is to fatten-up animals and to prevent disease in these septic CAFO’s! When we consume this antibiotic laden meat, we become antibiotic resistant! The meat industry plays by its own rules when it comes to antibiotics, while everyone else suffers the consequences. This, the externalizing of costs, is corporate capitalism's biggest lie. Be it water pollution, air pollution from particulates, greenhouse gas emissions, antibiotic resistance or the abuse of those cousins of ours named livestock, the corporate shareholders, including pension plans, only consideration is profit, that's capitalism. Serving the interests of the profiteers, that's politics. Choosing which politicians serve which profiteers, that's democracy. According to the UN Food and Agriculture Organization, emissions associated with livestock industries account for 14.5 percent of human-caused greenhouse gases. Who pays these avoided costs? We all do. Numerous peer-reviewed scientific studies have concluded that the 'Hoofprints' of CAFOs is astronomical. "The price of anything is the amount of life you exchange for it.” Henry David Thoreau said. The price we all pay to the corporate bankers and shareholder's is our collective health, our children's health and the health of every living thing upon which our species future depends. Each of us individually can make a difference in our personal lives by making good choices - i happily have been a non-meat eater for 38 years. But collectively individual choices matter very little compared to the destructive forces of corporate capitalism and the millions of consumers whose endless demands capitalism serves.